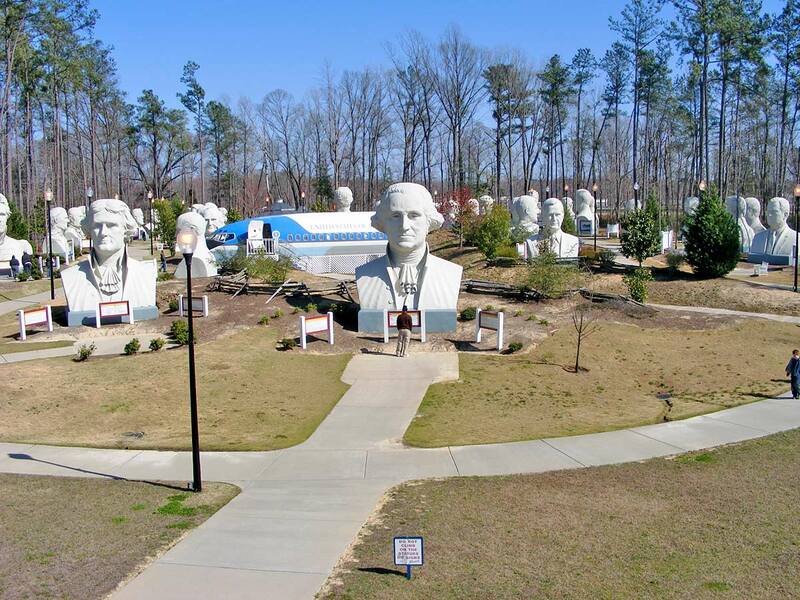 The Presidential busts originated in the President’s Park, an outdoor museum on the outskirts of Williamsburg, VA, featuring the busts of 43 of our former Presidents. 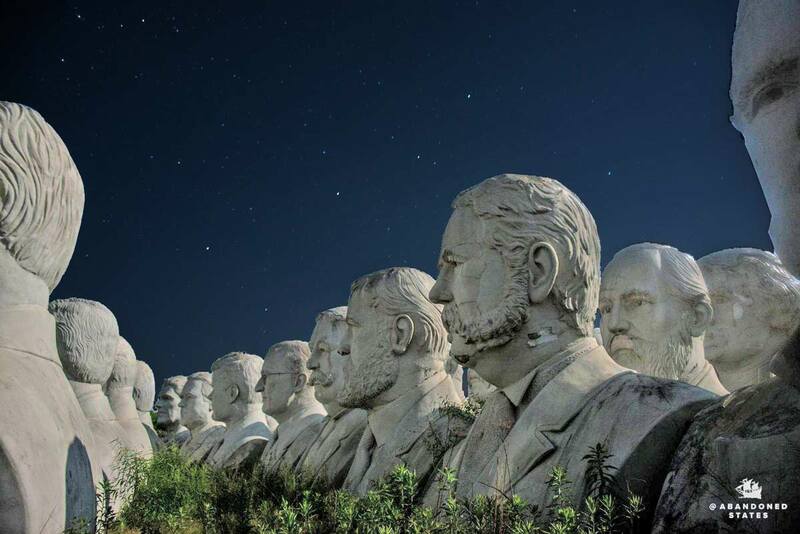 These 18-20 foot concrete Presidential busts attracted a lot of attention when they were constructed in 2004. Although the park was a grand idea it was dated and could not survive in its former location. It needed to be seen by tourists, but tucked away in the woods the park was invisible, which was ironic considering the size and glory of these busts. 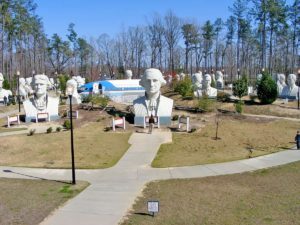 Howard Hankins, the current owner of the Presidential busts, was asked by the owners of the previous park to remove the statues that remained at the Park site before the land was sold. “I did not want to see these statues lost so I decided that I would move them to my farm several miles away”. Hankins then had to prepare each bust for its journey down the interstate. With the help of many men and several large excavators they decided the only way to move them would be to crack holes in the tops of the statue’s heads, lift them using the excavators, and place them on flatbeds for transport. This process took several days. Click here to learn about David Adickes, the master artist who created the statues. As a business man, Howard has owned and operated his own construction company for the past 35 years. “I would love to use my construction background to design and build a new President’s Museum that would become a treasure for all.” We need help in funding this new museum to give our Presidential busts the honor they deserve and help educate everyone about our great Presidents. The current idea is for the new location site to include these statues in a sterling, one of a kind theme park that as part of a Smart Cities concept to be located in the Urban Crescent area of Virginia, creating a tourist attraction adding to the existing attractions in the Kings Dominion area (a short trip by train from Washington DC). We expect this museum will create a total experience of the many facets of the US Presidents — their lives, the daily operations, history and more. Howard is spearheading this project with assistance from his family, friends, and local businesses, including Daniel Barnard & Associates, a Hampton Roads Financial Firm. This project will benefit the community and the people that visit. The new facility can include exhibits featuring an Oval office, Presidential transportation, The White House, First ladies tribute, a Secret Service and Covert ops area, an Air Force One display, and other Presidential documents and memorabilia. The other benefit of our museum is the desire for a partnership with the educational community. We plan to work with school teachers to bring American History facts into the museum and onto our website. This will assist students with general research and studies. Howard Hankins, Proprietor, and Daniel Barnard, Public Relations/Administration Manager, and their team consisting of Architects, Engineers, Scientists, Audio Visual Technician, are all steadily moving forward with this project.